This exquisite collection of vocal solos features folk songs from China, Japan, Korea, Malaysia, Taiwan, and Thailand. 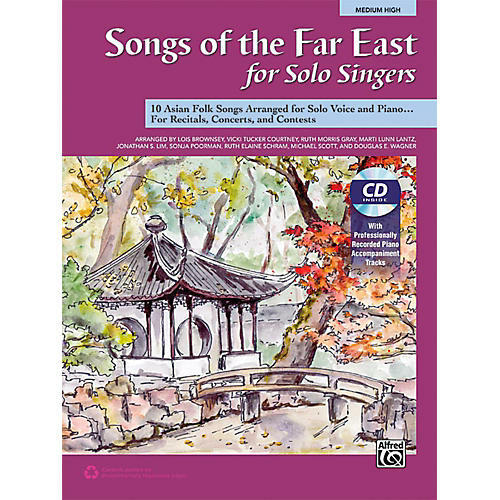 Appropriate for both developing singers and mature vocalists, each of the ten beautiful arrangements is sung largely in English and a phonetic pronunciation guide is included for the phrases in Asian languages. Titles: Arirang * Burung Kakak Tua * Flower Drum Song * High Green Mountain * Japanese Snow Song * Jasmine Flower * Kangding Love Song * Loy Krathong * Sakura * Uji River.